It was Monday morning and the post holiday blues were beginning to set in. I woke up to rain just as I had got my shoes on to take the dog out for his morning walk and the sky looked a miserable, unappealing dark grey. Just my luck I had a full washing line groaning with towels and bedding. Why does this always happen? On days like these when you know you have so much to do but the weather spoils it you just want to stay inside and hibernate like a hedgehog. I know on such occasions I always want to put my apron on and get out the mixing bowl. I had no customers to bake for yesterday but a fruitbowl full of apples and some leftover blackberries. The first thing that springs to mind with blackberries and apples is to make a crumble with it. I thought I’m always making crumbles and I wanted to try something different. I looked through the Good Food Apps on my iPhone which are a fantastic source of inspiration but then my eye hit on my spanking new Great British Bake Off book which was gleaming at me from the shelf in my kitchen. I was positive I had seen a fruit pie in the book so I went back to look for it. 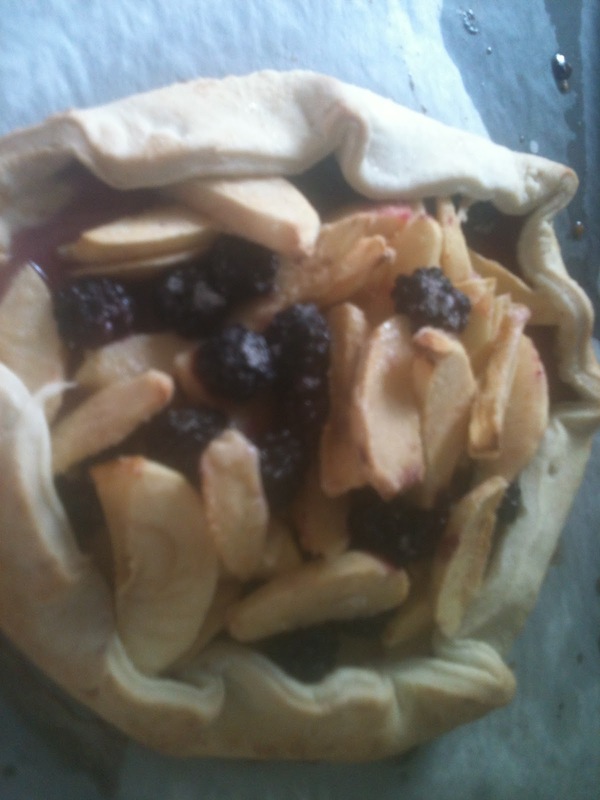 It wasn’t an apple and blackberry pie but in fact a Nectarine and Blueberry Gallette! I had seen a similar freeform pie in Delia Smith’s Summer Cookbook and once made a pear and raspberry pie like this. The pastry is rolled out to a giant circle, you pile the prepared fruit in the middle of the circle and then form it around the outside, pleating it carefully so that you are left with the fruit showing through in the middle. However, I am sure that Delia’s version from memory was with a sweet shortcrust pastry. This version in the Great British Bake Off book required me to make pate brisee for the first ever time. As the name suggests this is a French pastry recipe used to make pies and tarts. You use the same ingredients as the shortcrust pastry but you combine them together in a different way. This required me to work the dough together on my work top. I found this part ok but as per usual I was rushing as my daughter came in and asked if she could go to her friends’ house in Knaresborough for a sleepover. This was fine with me but she had a horse to sort out before she went over there as well as our dog needing another walk. As a result I didn’t roll the pastry out thinly enough and cut round one of my dinner plates to achieve a perfect circle. The tart assembly went well and I pleated the dough carefully around the fruit, securing it with a glaze of melted butter. I had to leave the tart on the tray unbaked until I got back from Knaresborough (a round trip of 50 minutes including horse duty) but I did put my chicken casserole in the oven and hope it didn’t burn while I was out. When I got back my hubby had arrived home and I had to chuck the tart in the oven before tea. Here is the finished tart. The pastry had puffed up a bit and I thought it could have looked a lot better! My son had his friend for a sleepover and neither of them fancied a slice of the tart for pudding with a scoop of vanilla ice cream. My hubby and I had a small slice each. Not one of my best efforts but I would like to try it again when I have more time and no interruptions! Famous last words!